The views are good from the top, just ask Drake. In 2016, Drake is the world's most streamed artist. According to Spotify, he racked up 4.7 billion streams, which more than doubles the record breaking 1.8 billion streams he earned in 2015 when the title of most streamed artist was first bestowed upon him. So it's no surprise to hear that Drake is also Spotify's top streamed male artist and has the most streamed album with Views. His song "One Dance" is the most streamed song in Spotify history, beating out Major Lazer's "Lean On" featuring Mø and DJ Snake. Drake's one song has been streamed 970 million times since it dropped in April and is the most played breakup song of the year. But, it can get lonely at the top, which is why it's only fitting that Rihanna is the one sharing that throne with Drizzy. Spotify named Rihanna 2016's top streamed female for the second year in a row, too. Her album ANTI has been heard over 2.5 billion streams, making it the third most streamed album of the year. She also earns the three spot on the list of most streamed artists of the year. But, for all those Drake and Rihanna shippers out there, there's one stat that should make you very happy. 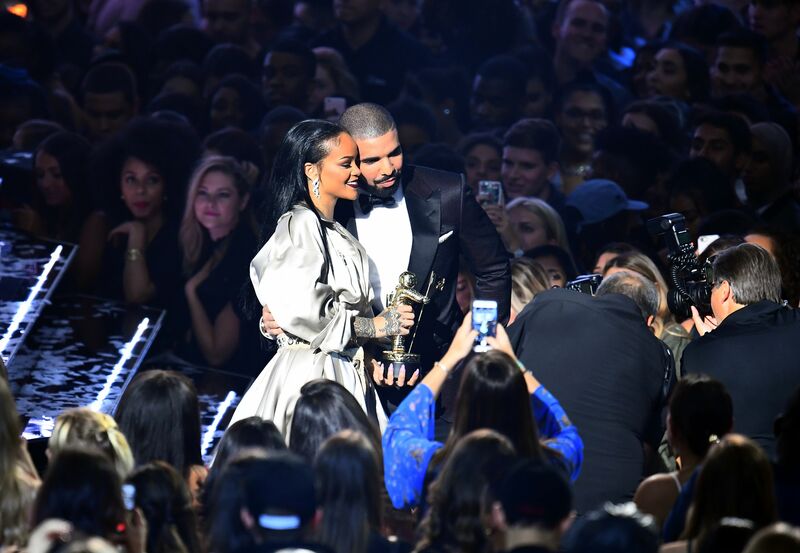 Rihanna's song "Work," which yes, features Drake, was the fourth most streamed song of the year. Rihanna and Drake may not have made it work romantically in 2016, but what's very clear is these two are the ultimate work couple. When Rihanna and Drake team up, they make beautiful music — quite literally. Both their musical partnerships, "Work" and "Too Good," were off the two most streamed albums in the U.S. in 2016. It's why no matter what their relationship status is in real life (I'm going to guess "it's complicated"), professionally Drake is Rihanna's work husband, while she's his work wife. Just like an office with bad lighting and sad desk salads, the music business can be a frustrating place, so having a partner can make it easier to survive. Someone who is in the trenches with you, day in and day out. Someone who always has your back, no questions asked. They just get it. A work spouse, unlike a romantic spouse, is there to gossip with you about all your co-workers. So, when Drake's girlfriend just can't talk about Meek Mill anymore, Rihanna can be there to let him know that she believes he writes his own songs and they'll always be better than Meek's. When Rihanna gets sent a cryptic Facebook message from her manager or publicist, Drake will be there to help her decipher it. A work spouse will also be there to support all your wacky ideas. Like, when Rihanna was wondering if she should really launch that sock line, Drake could be there to let her know that there's no other pop star he'd like keep his feet warm. Or, when Drake feels like women are becoming a distraction for him ("They want to be on TV next to me," as Drake told us on "Hype"), Rihanna offers to be right next to him to shield him. Most importantly, for someone like Drake, who isn't big on making new friends, Rihanna has been a confidante. Someone he's let into his inner circle. She's someone he trusts to help him make music that is straight from the heart. He's unafraid of judgment, she allows for a safe space because she gets it. That's what work spouses are for to encourage you to keep excelling on your craft. In fact, the BBC recently reported that having a work spouse can actually be the key to your success. This person not only makes you feel happier at work, but offers a support system to help you push yourself further in your field. So, instead of trying to make a love affair between Rihanna and Drake happen, we should embrace the platonic relationship they currently have. RiRi and Drizzy, the best (work) couple of 2016.